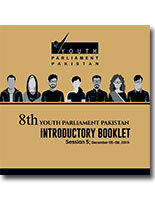 This Introductory Book presents details about the Fourth Session of the 8th Youth Parliament Pakistan and its selected members. 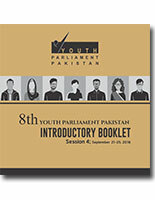 This Introductory Book presents details about the Third Session of the 8th Youth Parliament Pakistan and its selected members. This Introductory Book presents details about the Second Session of the 8th Youth Parliament Pakistan and its selected members. This Introductory Book presents details about the First Session of the 8th Youth Parliament Pakistan and its selected members. 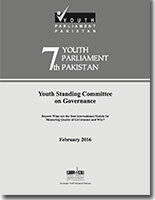 Youth (Age 15 to 29 as defined by the Government of Pakistan) forms a very significant segment of Pakistani society. The “Youth Divided” with over forty per cent of Pakistan's population as 18 years old or younger is both an opportunity and as a challenge for Pakistan. While many governance challenges affect youth, the elimination of important platforms such as those of Students Unions have hampered youth’s political education and honing of leadership skills. The challenge of positive engagement of youth in the democratic process has become even more crucial in the face of newer challenges and negative appeal of militant ideology. Since its inception in 2002, PILDAT has focussed on political engagement and leadership potential of youth. 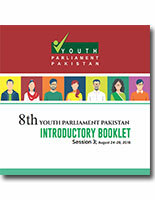 Working with young MPs in the Parliament, PILDAT has facilitated the formation of a Young Parliamentary Forum by bringing together young MPs to assist them in honing their skills. Special programmes of international and regional dialogues and discussions have been organised over the years bringing together Pakistan’s young legislators with those of USA, UK, India and other countries. 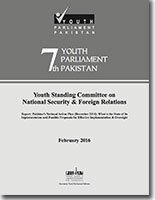 PILDAT was a pioneer in the field of conceiving, facilitating and running a nationally representative Youth Parliament since 2007 which has successfully completed 8th batches since. 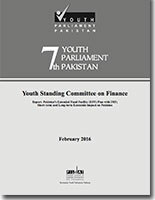 The success of a national Youth Parliament has led to establishment and running of provincial Youth Parliaments in the Provinces of Khyber Pakhtunkhwa and Punjab, as well. 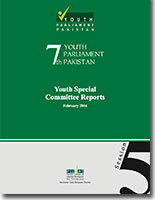 So central is the subject to Pakistan’s democratisation and leadership that PILDAT developed and disseminated a first-of-its kind study and analysis on Mapping Future Leadership of Pakistan to identify the future political leaders of Pakistan by ascertaining the vision of the potential new leadership about the future of Pakistan so as to assess gaps in leadership skills so that contribution may be made towards efforts of capacity building.